In New Eden there was now a war, and in this war the capsuleers duked it out in the darker parts of space, and in those parts where lawlessness reigned there followed the capsuleers like remoras a type of people who would pick off the tattered remains like scraps of flesh from a rapidly calcifying bone. They had reached Adek's mining station and torn through everything. He was running so fast his lungs burned with the effort. Most parts of the colony were blessedly empty, its inhabitants having fled the war zone for fear of capsuleers. And just when those who remained had been getting a handle on running the colony with a skeleton crew, the scavengers had arrived; a small team of pirates using the capsuleers' presence as cover to strip the colonies of all useable hardware. The thieves had been clever. They'd detonated several surface explosives before even venturing into the station, causing several colony sections to collapse or decompress. The explosives had been full of high-reaction incendiary gas that had eaten into the oxygen onboard the colony. The crew that hadn't died from fire or structural collapse had choked to death, clawing at their throats. The brave few survivors who had tried to bar the pirates' entry in the boarding areas had been killed on the spot, burned and shredded beyond recognition by the invaders' lasers. Adek rushed to one of the emergency chambers and fitted himself inside a spacesuit. It was a clunky thing that would slow him down, but he had no idea where he was going, and it might involve one of the airless locales. He glanced up at a monitoring screen that scrolled through the few rooms still in use, but quickly averted his gaze. It showed him nothing but death. He moved on in a delirium of fear, and a few airlocks later fell to a choking halt, his legs refusing to hold him up any longer. He lay on the ground for entirely too long, eyes shut tight, expecting at any moment to feel his skin burst and split under the unyielding glare of the scavengers' lasers. When nothing happened, he risked a small peek and found that he'd made it to the Pits. This was a vast cavern, full of dark and echo. The center portion of its circular floor was a giant gaping maw, a sheer drop many storeys down with sharp rocky outcroppings on all sides. Those outcroppings in turn were pitted with large holes, each of which had a solid metal covering. The floor around Adek was dotted with mining and excavation equipment, with everything from pickaxes and miniature mining lasers to multijointed MTACs with surface cling abilities. This was the heart of the operation. The Pits' metal core was the first thing that had shown up on surface scanning back when the asteroid was being settled, and it remained the main source of the colony's ore output. But the rock was a fickle thing. Many of its tunnels, cracks and crevices led directly to empty space outside, and more than one exploring miner had perished before they'd managed to block off all the holes and properly oxygenate the place. Each of these dangerous exits was covered with an automated shaft lid. They could be opened remotely on those occasions where a brave employee was willing to spelunking, hooked onto a rescue line or strapped into an MTAC, but as the entire Pits area had to be evacuated first, this was rarely done. Adek crawled towards the edge. They'd be coming here soon. They had been murdering their way through each section of the colony, clad in combat gear and armed with laser guns, and sealing off the parts of their passage to prevent anyone from getting around them or backtracking. When a laser weapon fires at human flesh, what happens is a sizzling, bubbling explosion. He'd seen the results on the monitors. It really was a long way down. If a body went over the security railing and jumped with all its might, it might clear the safety nets and the outcroppings below and plunge straight to the bottom. The result would be an instant death, not painless but near enough compared to a solid-state laser beam bursting through one's chest. The covered holes in the depths of the Pits looked like pocked flesh, burnt to cinders. Adek thought he might vomit in his suit. He rolled onto his back and waited for the inevitable. He tried to empty his mind, but it kept returning to the holes in the rock, and to the scavengers rushing in. Entrances and exits. In the haze of adrenaline and quiet fear he imagined them rushing into the Pits, running right over him and going out the tunnels, into empty space. All roads led to the Pits. No matter where the invaders were, they would eventually find their way here. It was the most important part of the colony, for if something were to go wrong here, either with the equipment or the place itself, it would be much harder to contain and correct than in any of the smaller, sealed-off corridors that snaked their way through the rest of the base. Adek rolled onto his stomach again and stared into the Pits. There were several tunnels down there, shut and sealed off, that he knew led straight into space. A small, stupid hope arose in his mind. It was so faint that he did not even dare acknowledge it. 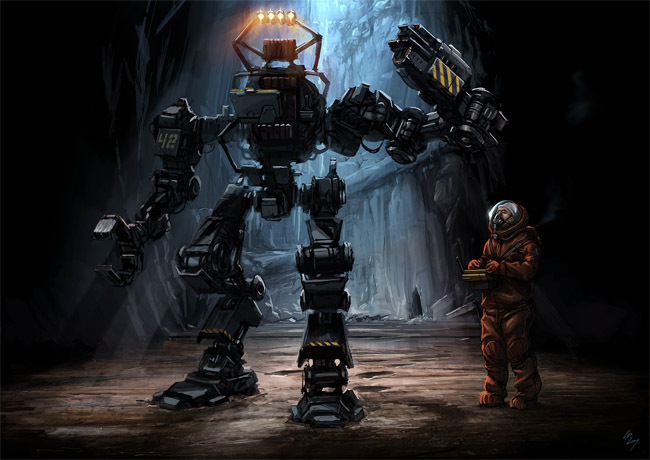 Instead, he got up and walked up to the nearest MTAC, a metal skeleton used for heavy-duty mining work. He activated its wireless controlling unit and grabbed its remote, then rushed to the corridor that led to the Pits' control area. Even though the entire area was still quite well oxygenated, he kept his suit on. He made his way to the elevator and took it upstairs, counting the seconds it took him to arrive. He stepped out and into the central control room, whose windows overlooked the entirety of the Pits. It functions were focused almost solely on this core of the colony, but there were a few concessions to life outside the Pits, mainly in the form of activity detectors. If the doors that connected outlying colony sections were put into use, it would show up here. Adek keyed in his security code and sounded a general alarm. Klaxons blared in the Pits and computerized voices called out danger. Immediately, he saw increased activity of movement that steadily crept closer to his area. The scavengers were coming. He waited and watched through the windows above, feeling entirely too calm. When they finally came, little figures trickling in through the doors far below, he detached his facemask, turned off his oxygen flow, ran to a corner in the room and vomited so hard he thought he'd torn something inside himself. As soon as he could, he stumbled back to the control desk. The intruders were moving about in the Pits, trying to figure out the source of the problem. Adek checked the motion detectors and saw a couple more blink. Two more men entered the Pits right after, and the detectors fell silent. They were all there. Everyone who ever worked in the Pits learned the override sequence. There was only one, and you hoped you would never in your life have to use it. He keyed it in. Down in the Pits, metal shutters clanged down and shut off every single entrance to the area. Adek imagined the noise they'd have made, but the echoing blare from the klaxons drowned out all other sound. The intruders looked around in panic, hefting their lasers at dark crevices. Adek said a silent thanks to whoever had thought to set the control room so high, outside of their view. There was another sequence that allowed you to open the holes in the Pits, but it wouldn't work on its own. All it would do was disengage the regular locks, but if the Pits had gone into lockdown mode the holes wouldn't open automatically. Unless one had an agent on location, as it were. Adek hefted his MTAC remote. Before the astonished eyes of the murderous intruders, one of the MTACs lurched into action, walked past them, broke through the security railing and launched itself into the Pits. It landed in the security net, cut its way through and ended up on one of the ledges below, a drop that took several seconds but was still well above the final pit. The ledge it lay on led to one of the blocked tunnels. The MTAC walked from the precipice over to the sealed tunnel, hefted a limb armed with a mining laser and started burning through the door. It took a while, and to their credit the intruders didn't take long to kick into action. Various sections on the MTAC's skeleton blinked under kaleidoscopic laser fire, but the scavengers' weapons were antipersonnel guns and did little to harm the machine. By the time one of them finally ventured into the Pits and started carefully climbing down to the ledge, it was too late. Adek saw the door give way and set the MTAC to push forward with all its might. It did, the pistons in its metal legs shoving against the rock, and the door slowly crumpled inward under its thrust. Its journey from here on would be blind, but that was immaterial. Adek called up schematics of this tunnel and saw that it led in a nearly straight line to its crevice point. He set the MTAC to march forward, mining laser held forth, and waited. By the time the intrepid scavenger had made it down to the tunnel mouth, the MTAC reported resistance. It had reached the wall. Adek forced it forward as hard as he could. At first there was nothing. The signal from the remote merely blinked off, and for a frozen second of terror Adek thought the machine had broken. Then there was a rumble, as if an animal were waking from its sleep, and Adek saw the intruders scramble for the doors, banging on them and firing with their lasers. He smiled. The MTAC had gone through; the Pits had been ruptured. Space was claiming its own. As several warnings sounded in the room, of low oxygen, low pressure and critical danger, Adek calmly re-attached his face mask and sealed off his suit. He took one last look out the window and couldn't help but laugh as he saw the vultures clinging pitifully to whatever they could. One or two had lost their grips and were being sucked into the Pits already, to be tossed out into space like refuse. They all wore suits, though, and once all the air went out of the area, they would be able to move again. He couldn't risk that. He made his way to the elevators and went down to a storage area on the ground floor, next to the Pits. There was a small squadron of MTACs here, many of whom were outfitted for dead space work. He got into one, checked that the claws on its limbs were in good function, and used its arm to unseal the door into the Pits. Immediately he felt the drag, as if his body wanted to freefall. The pull was immense. Thankfully, the MTACs claws gripped the floor with ease. The intruders noticed him, their eyes wide with shock and anger, but the few that remained were no threat. Most suits had emergency wire loops that let you lasso yourself to some fixed spot, and a few of the intruders had managed this. Unfortunately for them, their weapons hadn't been fixed in the same way, and all they could do was flail madly as Adek approached. He raised his machine hand, and he cut through their wires. Most of them panicked and some visibly screamed inside their masks. One or two even refused to tumble away and instead grabbed on to the mechanical arm, where they clung on for dear life. He bashed them against the wall until they broke or let go. Before too long, it was over. Adek was alone. He marched his MTAC back through the empty Pits and into the control section, closed it and sealed it, and got as far as the elevator entrance before collapsing in tears. Eventually he hauled himself back up and took the elevator to the top floor, where he entered the control room and inspected the damage from up high. Everything that had not been nailed down in the Pits was gone, including the intruders. It was as if God had swept his hand over the earth and started anew. Adek was about to remove his facemask when a motion light lit up. He froze. It was one door, on the outer rim of the colony. Someone had stayed behind. One of the invaders was alive. The light lit again, and again, each time a little closer to the control room. This was the end, Adek thought. Everything was over. The whole world as he knew it would be extinguished. For no reason other than to have something to do, he cast his view outside his little world, using the control room's scanners to check on traffic elsewhere in the solar system. He discovered that the capsuleers had come. One of them was even tooling around quite nearby. He considered sending a plea for help, but discounted the idea. You didn't ask the gods of destruction to help you in times of need. Adek drummed his fingers on the control panel. The gods of destruction were here. There was a god of destruction outside his colony. The capsuleers were hungry gods, whimsical and easy to anger. And it occurred to Adek that it was, in fact, possible to call on the powers of the gods. One merely needed to present a worthy sacrifice. The little part of his mind that had cut the wires down in the Pits now took over again. He typed out a message and set it to general broadcast. It wouldn't reach far, for the colony had only limited transmission rights, but if he were lucky it would reach far enough. He keyed it to send, then checked the motion sensors. The scavenger was approaching fast. Adek swiftly resealed his helmet and fled the control room, running down a different corridor that would lead him to the emergency supplies warehouse. From there he would be cut off, with no escape routes and no way back to the colony proper. He'd be a rat in a cage. He reached the warehouse and immediately sealed its door. It wouldn't hold back a man with a laser, at least not for very long, but then, nothing would last for very long, one way or another. Adek searched quickly until he found an interstellar transport container. This one was as large as an empty house, cold and austere. He unsealed one of its entry points, pulled it open and entered. It was freezing cold inside, but his suit would protect him from the worst. He sealed the door from the inside, found his way over to the personnel transport section, strapped himself in and waited. He imagined the progression of events. By now the intruder might have found his way to the control room, where he would see the message being broadcast to the capsuleer. Even if the intruder shot the control board to bits, the message would continue to be relayed. It was a summons to the capsuleer, announcing that the station had been overrun with hostile pirates and that he was to destroy the place, rescue its precious cargo and get out before being swarmed by enemy forces. It wasn't a total lie, Adek reasoned to himself. He was very precious cargo. There was only one of him. There was a muted hissing noise in the distance. The intruder was making his way through the warehouse doors. Adek closed his eyes, breathed deeply and prayed. Before too long, the hissing noise was overtaken by a rumbling tremor. The container, which must have weighed a ton, began to shake. The noise rose to deafening levels. Explosions sounded somewhere in the distance.